8 "[[the next episode]]" vs "the [[next episode]]"
I noticed that you've made this mistake on both Ash Ketchum and Clemont (anime), so I figured I should explain it to you here instead of hoping you'll read edit summaries. Regarding User talk:Kittystyler#Grammar, please understand that you do not have the authority to give someone a "warning" about something. Saying you're "warning" someone of something like you did implies that you have the authority to enforce a punishment if they do not heed you. You do not. Only staff does. Please be careful about your wording in the future. If you're concerned enough, you can always bring an issue to a staff member's attention. "[[the next episode]]" vs "the [[next episode]]"
What in the world do you mean, no precedent, GrammarFreak01? Precedent would be every other page that doesn't have it. It in fact seems that you were the one who added the History sections to the pages linked above. I.e., until your edit, it seems the page's precedent was no History section. And no one else who touched those pages thought a History section was needed. I've also noticed that a significant number of COTD pages that have History sections seem to have been added by you relatively recently. And even then, the great majority of COTD pages still don't have a History section. Your recent edits to the talk pages of Kittystyler and Erica124 display signs of aggression. As far as I've noticed your contributions, this is somewhat of a habit you have (including attempting to give warnings), and that simply isn't kosher. Play nice. If you have a problem with another user, take it to a staff member and let them sort it out, don't comment on their talk page if you can't be constructive. Use your imagination! ^^ Let me give you a suggestion. If you're on a computer, just use a text editor to copy out bits of the text a time and edit those. If you're on a phone or something, then it may be good enough to just throw a bunch of newlines before/after paragraphs that you want to focus on; you can easily remove them later when you're finished with editing that part and move on to the next part. 1) I don't have patience for exaggerated argumentation. Your "point" entirely misses the mark. Do. Not. Make. Pointless. Edits. You cannot justify an edit that does not change the page. End of story. As a rule, please ask someone on staff about creating a new page before you actually do it. There may be some pages that will always need to be created. I believe characters of the day are an example, so that case isn't a problem. But otherwise it's probably best to just check in with a member of staff before you create a page, especially if the content is already on an existing page. Since you edit a lot, I thought it'd be worth bringing this to your attention. Please do not make links like this. Consecutive links on words that are not plainly separate are just a bad idea all around, but especially so for mobile users who can't even tell what each link is without tediously checking each one. In this case, I don't think the links to those episodes are all that useful, so I've just reverted it here. But in other cases, there are other solutions that work very well. Like, for example, just adding a parenthetical somewhere appropriate in the sentence with the links there. Saving and finding the next thing can't be that much faster than just previewing and finding the next. After I save my edits in one section, I'm then easily able to use the sidebar menu to go to the next section that I want to edit. But what if I have different edits per section? You can jump to sections in a preview of the whole page exactly the same way that you can on the regular page. Oh. I didn't think I could do that. Never mind. I don't think we're following each other with that second part. Could you clarify what you were asking originally? (resetting indent)Um. I can try? Yes. Or windows if you want. Or you could also make it work other ways. ...But that's not the important part. Just to say thanks for your help with my Gladion's Umbreon page. Just FYI, telling someone like here to check a page's history before making edits is, honestly, kind of ridiculous. For one thing, edit summaries are often blank, and it's certainly not reasonable to ask anyone to manually check more or less every past edit to see what they were all about. For another thing, no one really thinks like that. Long-time users know about issues because they're paying attention. You simply can't blame a new user for not having any idea about past situations. But I really doubt most long-time users make any regular practice of checking a page's history either. I don't. I just know about what I've noticed. While I'm here, this note also has room for improvement. "An edit such as this" is kind of meaningless (this applies equally to the other page referred to above); you may know what you think makes that edit more problematic than another, but they can't guess at that. If I were discussing that with the user, I would have said that 1) character names should follow their page names, and 2) character names are usually very important and should as a rule be discussed if you think a change is needed. As a final note, new users may not need a talking to for one mistake. People are allowed to make mistakes, and we don't want to come off like we're jumping on a new user. Notes become more advisable if issues persist. In short: be sure to give it careful thought. I've thought before that you have a habit of jumping into conversations where it may not be necessary. I don't fully trust that I'm altogether unbiased and/or right about it, so I haven't said anything before, but your comment here puts a toe over a line. I do not consider that there was any need for any further comment at that point. Your comment just puts more pressure on the user. I've kind of said it before, but please give careful thought to whether you need to jump into a given conversation. If you have something actually unique to contribute, by all means, speak up. I think you should really start to recognize when a staff member has stepped in on what can be considered an "official" matter, though. (If they're just teaching/helping, that's a bit of a different matter.) The fact of the matter is, if staff is handling that sort of thing, you should probably leave it to staff unless (again) you really have something unique to add. Otherwise, staff is very well equipped to make any response necessary themselves. It's honestly not really your place at that point to emphasize a warning or whatever. No. It is not appropriate to express your annoyance at someone. To be more plain, that is, itself, a form of bad behavior. Users may do it. But that does not make it the best way to handle any situation. Taking things personally and communicating in that mindset is a recipe for bad blood. You're continuing to be at least a little heavy handed on Veralann's talk page. I think this comes from you being a bit overly frustrated with the user and bringing that to your interactions. I'm going to lay out two options. Either find a way to tone it down (focus on helping a new user, not on your frustration or whatever). Or just lay off your involvement on Veralann's userpage: if you see a problem with them in the future, you can bring it up to a staff member. 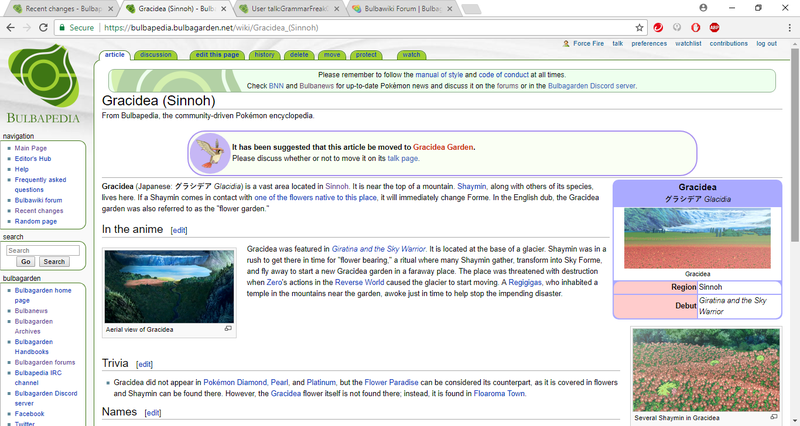 Bulbapedia does have any outright problem with regular users helping out other users or trying to inform them of rules. (The ambivalence in that statement only means that there are always bad ways to do things.) Whether with Tygamer or the user GrammarFreak01 actually referred to ForceFire, I do not think that GrammarFreak01 wholly overstepped any bounds. If a user is proving an intractable problem, then yes, it's probably best turned over to staff at that point, because regular users have no authority to issue any ultimatums or any power to enforce consequences. >Not sure how this is relevant to Cyndaquil. It's the source through which the huo shu is the most famous, and adding that bit of information helps comprehend what the creature is based on relative familiarity. But god forbid people learn something new, am I right? Nevermind that assuming the contrary throws the very utility of the trivia section into question. I did not ignore what you just said. I just think your reasoning for including it is not good enough to excuse inclusion. From where I'm standing, "Origin" sections always talk about the things that inspired the Pokémon of concern, and they do not go off on small tangents for the sake of "clarification". Nothing more, nothing less. If the robe itself played a part in the inspiration of Cyndaquil, yes, it could be included. But if it's just going to be included for the sole sake of bringing further context on the legend that inspired Cyndaquil, then I don't see what's the point of its inclusion if it didn't inspire Cyndaquil itself. Why go off on this tangent in the "Origin" section if it has nothing to do with Cyndaquil's origin? This page was last edited on 23 November 2018, at 10:11.